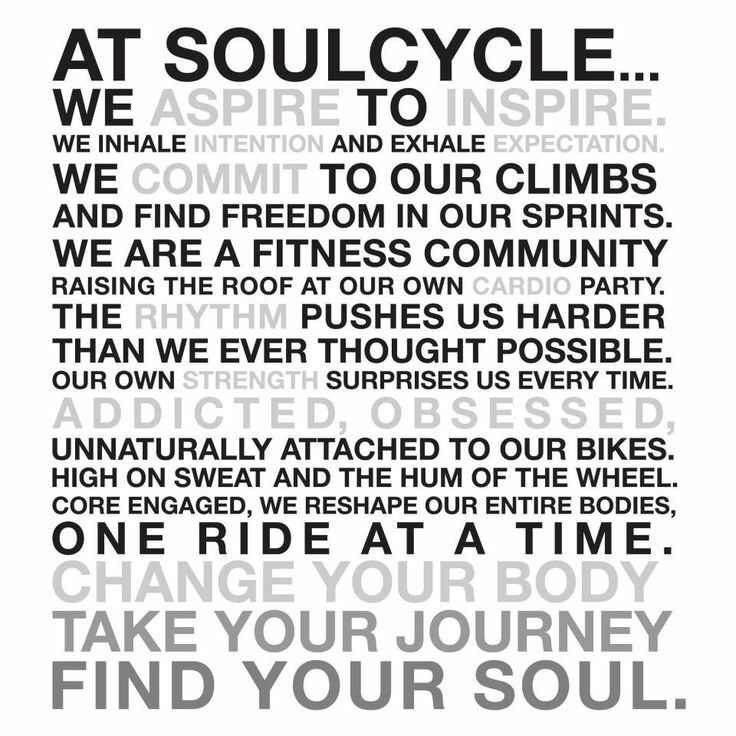 SoulCycle is indoor cycling at it's craziest. A hybrid of yoga-mentality and an athleticism I can identify with moreso than with yoga poses, I feel as though my body, mind, and spirit get energized. Ok, and exhausted. Instructors are totally in control of the music, moves, and vibe. You feed off of their energy and the energy of the other riders. It's basically a sweaty party on a bike. This atmosphere is why I choose to ride here so much I may just need an intervention. You're encouraged to dance, sing, cry (yes, I've cried) and push past where you think you're capable of being. Every instructor finds their own special way to shove you out of your comfort zone to change your body and more importantly to show your pesky mind that it needs to shut up because you're capable of anything. Christine’s cycling classes are a form of 'inner-Olympics'. She guides students to explore a deeper emotional connection to their physical efforts. Christine is a true believer that we create change by stepping outside our comfort zone to cross our personal finish lines. Emily helped me adjust the seat and clip in (omg, biking shoes are so funny). Christine chatted us up before the class and found out a little bit about our personal journeys with weight loss. Christine reassured me that since it was my first time spinning, to really listen and respond to what my body was telling me (we found out afterwards that in one of her previous classes that day someone actually vomited while on the bike... I'm glad she told me this AFTER the class). I knew ahead of time that I wouldn't be able to keep up with most of the people in the class (partially as it was my first time, but also because I'm not a natural on a bicycle). At first things were going really well. I was able to (reasonably) keep up with not just the speed and resistance on the bike, but the movement of going off the saddle and shifting my weight forward and back. However, once we increased the resistance to mimic going up a hill, I started to experience two uncomfortable things: (1) my heart rate skyrocketed (I am normally at a 145-150 while on the elliptical; 160-170 while on the treadmill; this felt around 180 or so) and (2) my sinuses just let it rip and post-nasal drip galore. But just like Christine's bio says, we all have our own comfort zones, our own goals, our own finish lines. I took the time to sit back on the saddle (I decreased the resistance a bit and slowed down) and let my heart find a comfortable (but engaged) rate. I put my hand (and towel) over my heart and just whispered "Here" over and over again. It helped me stay with what I was feeling -- the uncomfortable nature of my heart (and mucus) being in my throat, and the desire to persevere. It was okay that I was uncomfortable. It reminded me of the first time I was on an elliptical running a 5k, then 10k, then 10 miles, then 13.1 miles. I wasn't perfect those times either. I focused on what Christine was saying. I focused on Christine (she dismounted and asked if I was okay -- I told her that my heart was racing -- she adjusted the handlebars and then increased the resistance (with a smile and a wink)) and what she was saying about being present while on the bike. I listened to the music. I looked deep for the answers to Christine's questions. Why was I there? What was I moving toward? And I stayed with it. I did what I could do. It wasn't the ride that everyone else did. But it was my ride. In my ﻿own way, I honored the "Going the Distance" ideaology -- that everyone has their own goals, everyone has their own struggles, but we face the challenge head-on. I will get on the bike again. I will ride again. I will condition my heart and mind. I will make Emily proud. I will show Christine I'm fit to keep up with her. ﻿I will always go the distance. awesome! congratulations. My first few spin classes were pretty rough- even now, though I love it, if the music isn't right or my seat isn't properly adjusted, the experience will be hell. Just get back on the bike. Wow. I was thinking about taking my first spin class next week...now I'm nervous! It sounds tough. (Your #ouchmycrotch tag cracked me up, though!!) I used to live riding a bike, but, the unfortableness of the seat just really turned me off to it. Maybe padded bike shorts are the way to go. Can't wait to hear about your next SoulCycle adventure! Jessamyn: I loved the feeling after (okay, a little bit sad that I had to slow down) -- and it will not prevent me at all from getting back on -- I'll just have to be better prepared. Nicole: Just make sure your instructor helps you set up your bike, and perhaps get a gel seat? 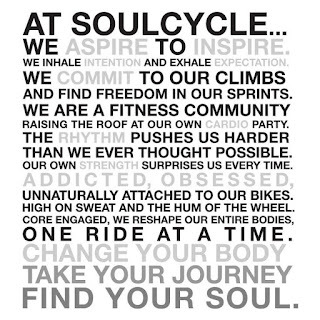 My next Soul Cycle adventure is up in the air, as they're only in NY, and i live in DC. Who knows -- maybe they will open a branch in DC! Good for you! I love the first 2 lines in the poster! That would make me want to check it out. Just based on those words. Cinderita -- I always choke up at "our own strength surprises us every time." Thanks for posting this. I like reading about spin classes (especially first timers) as it gets me pumped to try it myself. I do know one thing for sure though. I will definitely get some padded shorts first because EVERYONE says it hurts. Oh and do you need to buy special bike shoes? SoulCycle had loaner pairs of shoes for people to rent (free for first timers). And yeah -- it hurts, but in a good hurt -- reminds you there are frontiers needing exploration. **ANNOUNCEMENT** Finding Your Fight, The Class!